Attractive clusters of white, small flowers bloom in spring followed by small red fruits in late summer. Also has an attractive reddish bark. 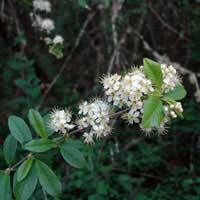 Can be a single trunked tree or a multi-stemmed shrub. Great for wildlife. fruits for birds and mammals, nectar and leaves for butterflies and larvae.